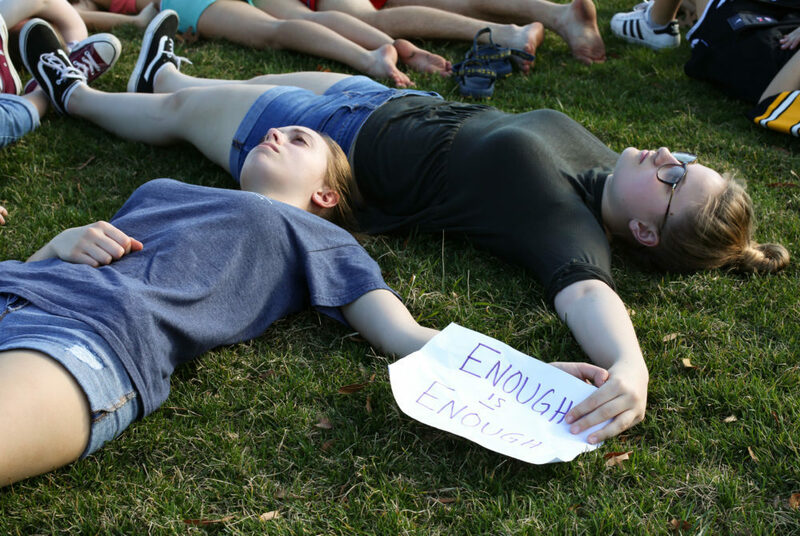 Vivienne Blouin and Lily Shirley, sophomores at H-B Woodlawn, lay in the grass in front of the Capitol during a 17 minute moment of silence in honor of the victims of the Parkland shooting. Updated: Feb. 22, 2018 at 9:15 a.m. 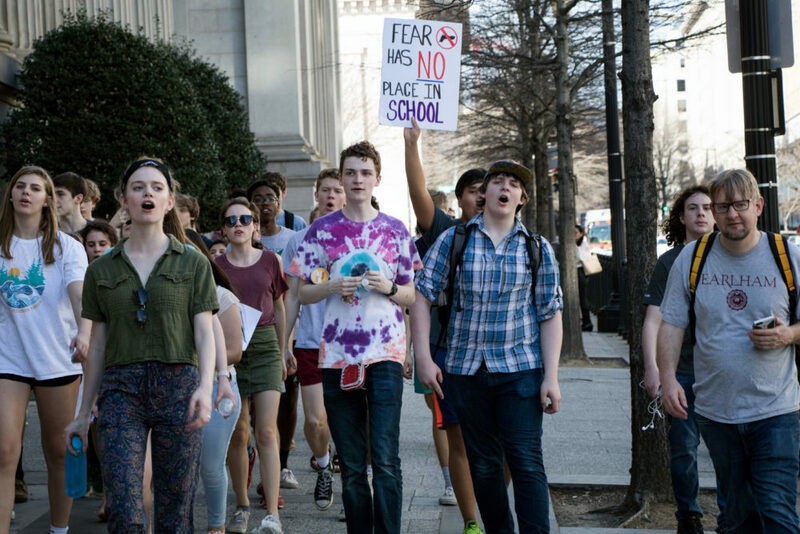 Hundreds of high school students from around the DMV skipped class Wednesday to demand gun control in response to last week’s school shooting in Florida. Students marched from the White House to the Capitol Building throughout the day, staging die-ins and carrying signs to demand change from lawmakers. About 100 students from H-B Woodlawn Secondary Program, an Arlington high school, laid down in front of the U.S. Capitol for 17 minutes of silence to honor the 17 people killed in the recent shooting at Marjory Stoneman Douglas High School in Parkland. These Arlington students walked nearly five miles from their campus to the White House and then almost two miles to the Capitol. They said the initial gathering was planned in a group chat the night before. The march gathered more people and students from other schools as the protesters made their way to the Capitol steps. “It just erupted,” Kieran Devine, an HB Woodlawn senior, said. 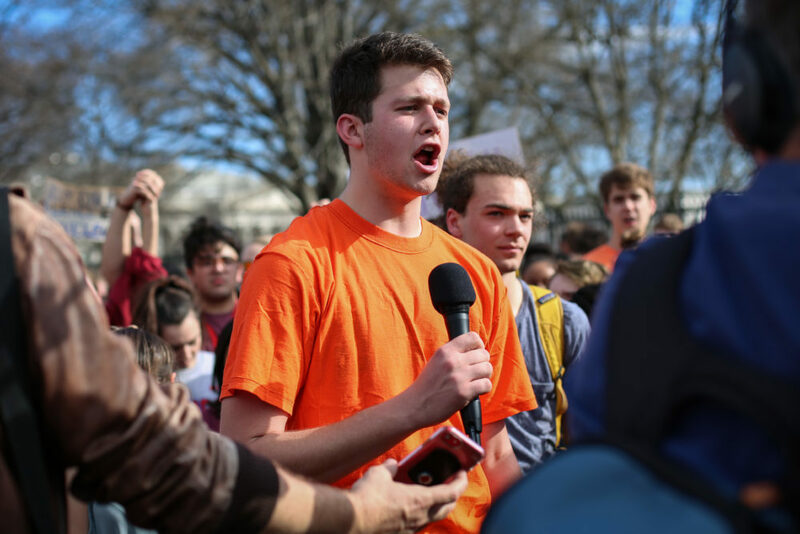 Jake Bennett, a senior at H-B Woodlawn Secondary Program, speaks to a crowd in front of the White House about the need for stricter gun control in light of the shooting in Parkland. Natalie Moreno, another H-B Woodlawn student, said they walked for three hours to reach the Capitol, from 12:50 to 3:50 p.m.
H-B Woodlawn students range from sixth to 12th grade. Jade Germanson, an eighth grader at the school, said she hoped the protest would set an example for even younger students. 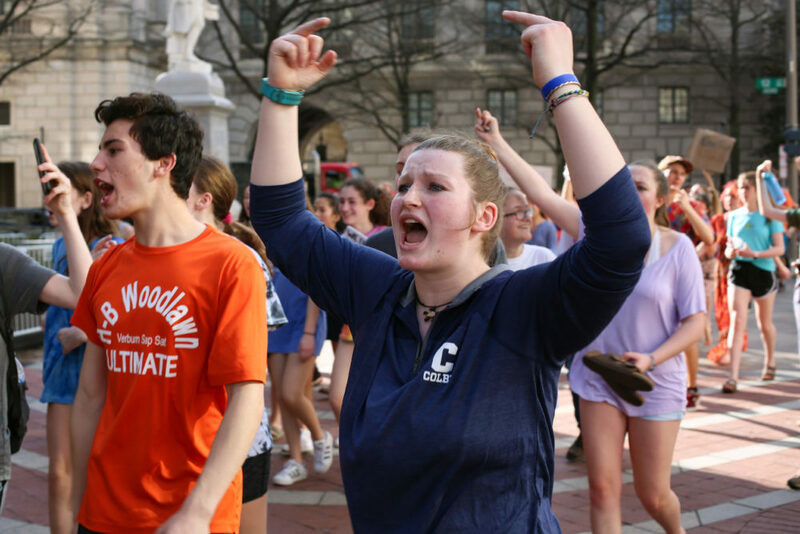 Students from an Arlington high school marched from their school past the White House, ending at the Capitol Buliding. Sophie Falkenheim, an H-B Woodlawn senior, said she was urging other students and even younger generations to hit the pavement and protest on weekends or after school. Falkenheim said H-B Woodlawn’s principal and administrators were supportive of the protest, as well as police in the area who started blocking off the roads so that the protesters could pass. Will Granger, an H-B Woodlawn senior, said he wanted to see legislation passed banning bump stocks, which can be used to make semi-automatic weapons fire more rapidly. President Donald Trump came out in support of banning bump stocks this week. Granger said he was also calling for expanded background checks for people purchasing guns. Emily Podgorni, a high school senior from Massachusetts, flips the bird at the Trump International Hotel. 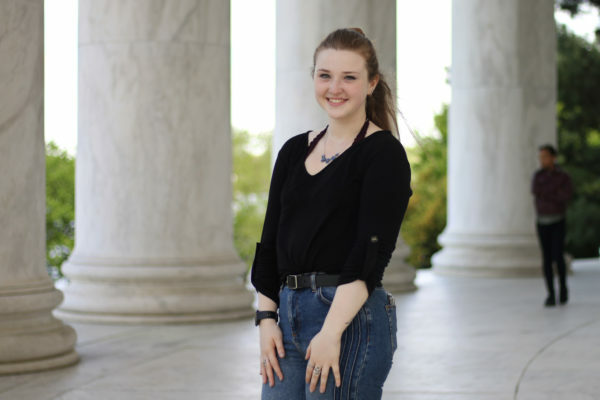 High school senior Emily Podgorni was in town from Massachusetts, visiting family in D.C., when she and her mother encountered the protest. They were applauding the protestors when Podgorni recognized a familiar face – her cousin, an H-B Woodlawn senior. Although disheartened by Congress’s inaction for reform, Podgorni said she hopes that even a small change might make students safer. Dani Grace and Meredith Roaten contributed reporting.